Pencak Silat, also known as Silat, is traditional martial art that originated from Indonesia. The mother of all Pencak Silat organization across Indonesia is Ikatan Pencak Silat Indonesia (IPSI). Pencak Silat has such a big impact to the world. Not only Indonesia, Pencak Silat has spreads far to Malaysia, Brunei, Vietnam, Singapore, the southern Philippines, and Thailand for the past few years. Thus, together, Indonesia, Singapura, Malaysia and Brunei establish an international organization for martial arts federations from various countries. The international organization of martial arts federations were named, Persekutuan Pencak Silat Antara Bangsa (Persilat). Persilat was established in March 11, 1980 on the initiative of Eddie M. Nalapraya from Indonesia, IPSI chairman at that time. Beside IPSI, some other national Silat organizations include Persekutuan Silat Kebangsaan Malaysia (PESAKA) in Malaysia, Persekutuan Silat Singapore (PERSIS) in Singapore, and Persekutuan Silat Brunei Darussalam (PERSIB) in Brunei. As a country that surrounded by forests and various kinds of wild animals, the ancestors of Indonesia were accustomed to protecting themselves from both human and nature. In fact, thanks to nature, the ancestors of Indonesia able to learn few fighting moves. By taking example of wild animals move, such as monkey, tiger, snake, hawk and many more, Pencak Silat as we know today is born. 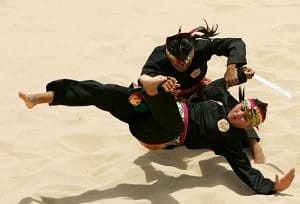 There is also another assumption that Pencak Silat came from the great skills of Indonesian native tribes in hunting and war. Cina and India are also bring influence of martial arts to Pencak Silat. Pencak Silat is believed to start spreading around the 7th century AD but no one know for sure. It was assumed that Pencak Silat spread from Sumatra to various regions of Southeast Asia seacoast. The spreading of Silat itself is just like any other kind of education. It was passed down from a teacher to a student. Although, at the very first time, it’s only simply from mouth to mouth. The famous ancient kingdom of Indonesia such as the Kingdom of Sriwijaya and the Kingdom of Majapahit are told to have their own powerful warriors. These warriors have a very great skill in using the movement of martial arts. Silat is more known as gayong and cekak Malaysia and Singapura. In Thailand, silat is known as bersilat, meanwhile it is known as pasilat in the southern Philippines. Almost every region have their own martial arts character or warrior that they proud of. From Sunda Pajajaran, there is Prabu Siliwangi, as well as, Hang Tuah, the commander from Malacca. Gajah Mada, the Mahapatih from Majapahit kingdom and Si Pitung from Betawi are also the most well-known martial arts warrior in the history and legend. In the 11th century, there is a legend of Minangkabau, a practiced Silat, which in Minangkabau language called Silek, by Datuk Suri Diraja of Pariangan, Tanah Datar, which later being developed by the Minang people throughout Southeast Asia. In the 14th century, the propagators of Islam contributed in spreading Silat across the country by teaching Silat along with the religion subject in surau or pesantren. Silat has become a part of the daily spiritual practice. Kuda-kuda is a term for the position of the foot tread to strengthen the position of the body. Sikap and Gerak is a term for certain movements that performed in a match. Langkah is a terms for the use of steps in silat, such as Langkah Tiga and Langkah Empat. Kembangan is a term for the hand movements and body gestures performed while paying attention and aware of the movements of the enemy, as well as lurking for a gap between the enemy’s defenses. Buah is a term for the defense and attack techniques in silat. Sapuan and Guntingan is a term for one type of buah (technique) to dropped an enemy by attacking the enemy’s kuda-kuda, which kicking it off with a swipe (cut), so that the enemy lose his or her balance and fall. Kuncian is a term for techniques to knock out an opponent until he or she become helpless, unable to move, or to disarm the enemy. Like a locking snake do to its food. Mental and Spiritual Aspects: to build and develop one’s personality and noble character. Art and Culture Aspects: to describe the martial art form of dance, music and traditional dress. Self-Defense Aspects: the emphasis on the technical capabilities martial. Sport Aspects: includes competition and the demonstration of forms movement. A tribute (salute) to the coach, led by the leader of the line. The closing ceremony of exercise ended with a tribute (salute) and shaking hands. Keris: a dagger with spired and sharp on both sides. Kujang: a specific knife of Sundanese. Samping/Linso: a silk scarf worn around the waist or shoulder in order to protect one from knife attack and to do Kuncian. Galah: sticks made of wood, steel or bamboo. Cindai: a fabric which is usually used as a glove or wrapped as head gear. Tongkat/Toya: a stick used by elders, travelers and musafir. Kipas: a traditional folding fan which can be made of wood or iron. Kerambit/Kuku Machan: a blade shaped like tiger claws that can betucked in women’s hair. Sabit/Clurit: a sickle used in agriculture, cultivating and harvesting crops. Sundang: a double edge sword of Bugis. Rencong: a slightly curved dagger from Aceh. Tumbuk Lada: literally meaning “peppercorn crusher”, a small dagger that is slightly curved like Rencong. Gada: a dull weapon made of steel. Tombak: a javelin made of bamboo, steel or wood. Parang/Golok: short sword used to cut branches that get in the way when passing through the woods. Trisula: a three stake or a three-pronged weapon. Padepokan is a complex of residential with a wide enough area that provided for learning, teaching knowledge and specific skills. 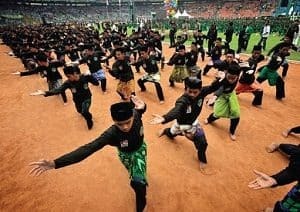 Padepokan Pencak Silat Indonesia (PnPSI) is a national and international scale of padepokan, which was officially opened by President Soeharto on 20 April 1997. PnPSI located in Taman Mini Indonesia Indah with total approximately 5.2 hectares of land area. The total area of the building is 8,700 m2 meanwhile the total area of the verandas is about 5,000 m2. PnPSI has many function that basically and mostly are all about anything relating with the activity of Pencak Silat. Pencak Silat has become the well-known sports competitions under the control and regulation of Persilat (Persekutuan Pencak Silat Antara Bangsa, or The International Pencak Silat Federation). In 1987, Pencak Silat was first introduced and competed in the 14th Southeast Asian Games (SEA Games) in Jakarta. During the 20th century, Pencak Silat has developed quite rapidly and Persilat has a big role in this. Persilat has been promoting Pencak Silat in several countries across 5 continents with the aim of making Pencak Silat became an Olympic sport. Their efforts pay off when the first Pencak Silat World Championship outside of Asia is being held in Vienna, Austria, in 1986. In 2002, for the very first time, Pencak Silat was introduced as part of the show program at the Asian Games in Busan, South Korea. 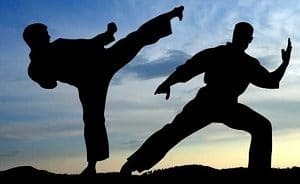 With so many potential on developing Pencak Silat to the face of world, it won’t be a surprise if Pencak Silat soon will be as well-known as Taekwondo or Karate. Not only in Asian, but also in Europe.